As good as it may taste, sugar isA?NOTA?your friend. It may a??feela?? like your friend when it comforts you (due to the beta-endorphin rush in your brain), but Sugar is really yourA?ENEMY. In 2012, more than 50% of all Americans consumed 1/2 pound of sugar per dayA?a?? translating to a whopping 180 pounds of sugar per year! The a? ?sugar rusha?? has been targeted at our children.A?American children are consuming about 10 times as much sugar as they were in 1900, especially in the form of high fructose corn syrup (HFCS), which is the average Americana? ?s greatest source of calories! Highly addictive HFCS contains fructose and glucose, but they are NOT bound together (as they are in table sugar) so the body doesna? ?t need to break it down. Therefore, the fructose is absorbed immediately, going straight to the liver, which turns it into fatA? (VLDL and triglycerides). a? ?Fructose also tricks the body into gaining weight by fooling your metabolism (it turns off the appetite-control system). Fructose does not appropriately stimulate insulin, which in turn does not suppress ghrelin (the a? ?hunger hormonea??) and doesna? ?t stimulate leptin (the a? ?satiety hormonea?? ), which together result in your eating more and developing insulin resistance.a?? This process also suppresses the immune system. But just because you avoid HFCS doesna? ?t mean that youa? ?re in the clear.A?Excess intake of ALL processed sugars results in compromised immune function (decreasing the white blood cellsa?? ability to destroy bacteria), obesity, and diabetes. And if thata? ?s not enough, keep in mind that sugar is HIGHLY addictive! Thata? ?s right! Dr. Serge Ahmed of Bordeaux, France, has been working with rats and giving them the choice between cocaine and sugar. Guess which one wins, time and again? You see, sugar produces dopamine a?? a happy, feel-good chemical a?? in the brain. People get addicted to eating sugar, whereby they need it to feel a??normala?? and they undergo a??withdrawala?? if they cut sugar from their diets. If they go a? ?cold turkeya?? for a few days, their brain will begin to produce dopamine on its own, but the discomfort of the withdrawal process keeps many a? ?sugar addictsa?? trapped in their addiction. Due to the anaerobic respiratory mechanism exhibited by ALL cancer cells,A?sugar is cancera? ?s favorite food!A?What this means is that cancer feeds on sugar.A?And since half of the white sugar in the USA comes from sugar beets, you should remember that most beets are now genetically modified with all the associated risks of GMOs. This is another reason to keep theA?a? ?White Deatha?? A?out of your diet and reduce your risk of various cancers,A?isna? ?t it? 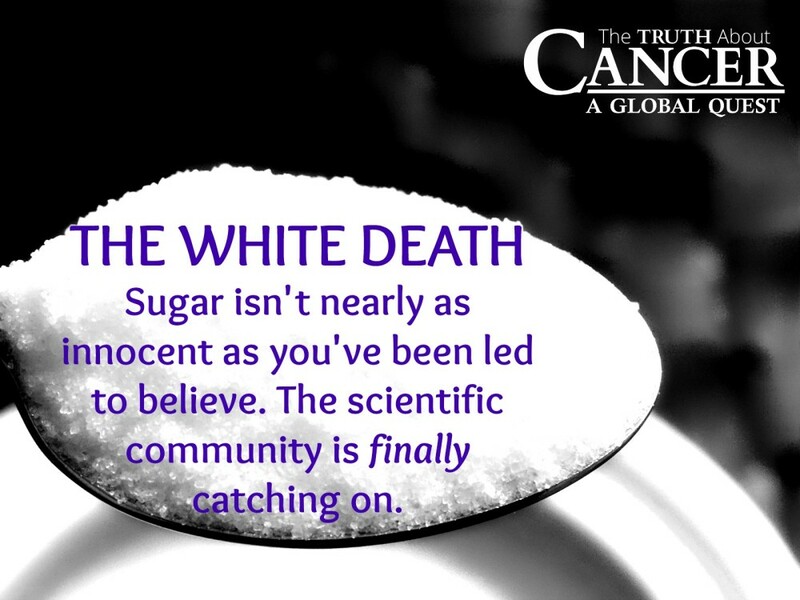 Whether you are currently healing from a type of cancer such as breast cancer or prostate cancer, or are simply trying to maintain good dietary principles, I personally recommend that youA?avoid white sugar, brown sugar, agave, and all artificial sweeteners such as aspartame/AminoSweet, sucralose, and saccharin. If you have a sweet tooth, ita? ?s best to stick with 100% organicA?green stevia, xylitol, raw honey, pure maple syrup, molasses, and coconut sugar. The bottom linea?? if you want to be and stay healthy, you MUST take control of your sugar intake so that it doesna? ?t take control over you and your health! GlucoseA? (aka a??dextrosea?? or a? ?grape sugara??),A?galactoseA?(a? ?milk sugara?? ), andA?fructoseA?(a? ?fruit sugara??) are all a??monosaccharidesa?? (i.e. single sugar molecules), known as a? ?simple sugars.a?? The primary difference between them is the way your body metabolizes them. Glucose is aA?form of energy you were designed to run on. Every cell in your body uses glucose for energy. High amounts of fructose are very damaging to the body if it isna? ?t burned immediately for energy because it travels directly to the liver where ita? ?s converted to triglycerides (fats). Excess triglycerides increase insulin resistance (and insulin production), thus contributing to diabetes in a a? ?back doora?? fashion. The simple sugars can combine to form more complex sugars, like sucrose (a? ?table sugara??) which is a a??disaccharidea?? comprised of 50% glucose and 50% fructose. a??Refineda?? white sugarA? (pure sucrose) is washed with a syrup solution, then with hot water, clarified (usually chemically) to remove impurities, decolorized, concentrated, evaporated, re-boiled until crystals form, centrifuged again to separate, then dried. By this point, any remnants of a? ?natural goodnessa?? and a? ?nutritional valuea?? have completely disappeared! Quite frankly, white sugar should be considered an a? ?industrial producta?? rather than a??food.a?? a? ?Brown sugar is white sugar mixed with molasses. a??Rawa?? sugarA?is not really raw. It has been cooked, and most of the minerals and vitamins are gone. But ita? ?s probably a little better than refined white sugar because it has a little of the molasses remaining. Aspartame or AminoSweetA?is a neurotoxic rat poisona?? need I say more? Splenda (sucralose)A?is NOT a sugar, despite its deceptive marketing slogan, a? ?made from sugar.a?? Ita? ?s a chlorinated artificial sweetener in line with aspartame. HoneyA?is approximately 50% fructose, but in natural (raw and unpasteurized) form contains many health benefits. Buying honey that is local and unpasteurized is best. SteviaA?is an extremely sweet herb derived from the leaf of the South American stevia plant, which is completely safe (in its natural form). Green stevia is the whole plant, while white stevia is processed and can often contain other ingredients like natural flavors or dextrose a?? a form of sugar. 100% organic green stevia in its natural state is what you want. Agave nectarA?is made from the agave plant, which is a cactus. Sounds natural, right? Like maple syrup from a tree, or honey from a beehive. Only it isna??t. Agave isA?HIGHLYA?processed while the end product does not even remotely resemble the original agave plant. Furthermore, agave is approximately 80% fructose (much higher than honey and maple syrup). HFCS (high fructose corn syrup)A?is 55% fructose and 45% glucose. It is mostly genetically modified. Stay away! RapaduraA?is the pure juice extracted from the sugar cane (using a press), which is then evaporated over low heat, whilst being stirred with paddles, then sieve ground to produce a grainy sugar. It has not been cooked at high heats or spun to change it into crystals, and the molasses is maintained in the sugar. a??Sucanata?? is the USA trade name for Rapadura. Coconut sugarA?is made from the sweet watery sap that drips from the cut flower buds of the coconut palm. It has a low glycemic index (GI) and is rich in amino acids. It is typically less than 10% fructose, with sucrose being the primary component. XylitolA?is a sweetener known as a a? ?sugar alcohola?? (or polyol). Sugar alcohols are neither sugars nor alcohols a?? they are carbohydrates (with structures that happen to resemble sugar and alcohol). Xylitol is extracted from corn or birch cellulose. Unlike sugar, Xylitol is slowly absorbed, does not cause a rapid blood sugar increase, and does not require an immediate insulin response from the body to be metabolized. Moreover,A? many studies have shown that it actually helps prevent dental cavities, ear infections,A?and some evidence suggests that it helps prevent gum disease because Xylitol is anti-bacterial. However, Xylitol does haveA?some potential health side effects (most notably gastrointestinal issues) and should be used with caution.